Wow, another 5k? That's three this year after going over two years without running one. Well, I really had nothing going on so I thought it would be fun to do another one to keep things interesting. Back when I ran the Whirli Run on June 1st I had targeted my training for several weeks hoping to crack 21 minutes but I knew that was not going to be happening here. Ever since my dnf at Bighorn in mid June , I have been piling on a lot of miles with June and July my two biggest months of the year and in the top 10 months all time so I wasn't expecting to run very fast on this day. Combine the miles with a hillier course and one of the nastiest muggiest days of the summer and I knew it was going to be tough. Despite that, I still wanted to give the race 100% effort with what I had so I prepared with my normal pre-race routine before heading to the starting line. There were about 250 runners so I expected a little more competition this time around. We headed out on a gradual downhill that continued for nearly all of the first mile. I got into a nice comfortable groove early and was trying to spot any competition. I noticed two guys that appeared to be close to my age move past me and by the 1st mile in 6:41, they were both about 30 yards ahead and seemed to be pulling away slowly. The next mile was several rolling hills. At the turnaround I started counting and saw I was in 18th overall. Pretty happy with top 20 in a race this size. I also noticed after the turn that I seemed to be gaining on the two competitors so I focused on trying to reel them in. Just at the two mile mark one of them started walking and just as I passed he began to run again but soon I could not hear him breathing behind me. One down one to go. Hit mile two in 7:08 and began the long uphill grind to the finish. 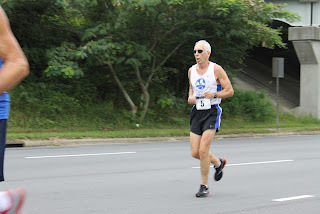 Just before making the turn back onto Blount Street with a little over half mile to go I made the pass of the other age grouper. I tried to make it a strong move but shortly after the turn was a block long steeper portion and I didn't want to push too hard and blow up. Once things leveled back out a little more I tried to pick up the pace a little and thought I had the 1st in age wrapped up but suddenly my competitor pulled up beside me and the race was really on. I matched strides for another 100yards but then he put on a surge and I had nothing and watched helplessly as he pulled away taking 1st by 5 seconds. But I pressed on and was able to be happy with beating my pre-race goal of sub 22 with a 21:52 official time and 18th overall and 2nd age group. Had a nice talk with the first place guy. Turns out I knew him as a customer from Capital RunWalk, Mike Martino. Congrats Mike ! Onto the next adventure. Stay tuned !